My Home and Garden: Oh, how I love salad season. I am so happy it is fresh salad time again. I'm quite lost when I have to eat greens from somewhere other than my own yard. I am so thankful I found the gardener hidden within. Here is what I foraged for tonight. We had a lovely bed of greens, with warmed goat cheese and ahi. 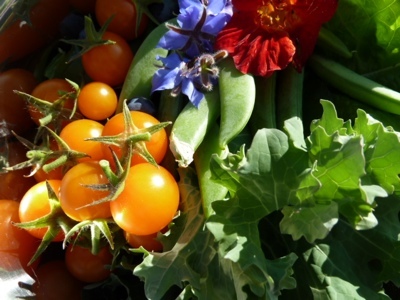 The greens were various lettuce, beet leaves, kale, snowpeas, borage and nasturtium flowers and lots of Sungold tomatoes. The tomatoes are the only hybrid I grow. They are like tomato candy! !